I love Rice Krispies Treats®. Growing up my Mom made them as an afternoon snack and, following in her tradition, I made them for my kids. Actually Rice Krispies Treats® was one of the first things that my Mom taught me how to bake. They are the perfect recipe for young bakers because they are No Bake, really fast and easy to make, and they use everyday ingredients. Marshmallows give these treats their deliciously sweet vanilla flavor. You can use either homemade marshmallows or store bought. If using store bought my preference is the miniature marshmallows, mainly because they melt faster. But it is important to use fresh marshmallows (so check the expiry date on the bag) as they melt so nicely. 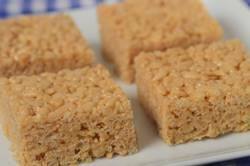 Peanut Butter Rice Krispies Treats®: Butter, or spray with a non stick vegetable spray, a 9 inch (23 cm) square baking pan. Place the Rice Krispies® (or crispy rice cereal) in a large bowl that has been buttered or sprayed with a non stick vegetable spray. Butter, or spray with a non stick vegetable spray, a medium sized saucepan. Melt the peanut butter, butter, and salt in the saucepan over medium low heat. Add the marshmallows and constantly stir until the marshmallows have completely melted. Add the vanilla extract and then pour the mixture over the Rice Krispies® cereal and stir until all the cereal has been coated. Immediately pour the mixture into your prepared pan and lightly pat until even. Cool at room temperature until the Rice Krispies Treats® have set. Cut into squares. Can be stored at room temperature for a few days.